One of the most neglected areas for most business in their marketing activity is their technology. It’s an afterthought, left to the IT guy, or the Marketing Junior. It’s the thing that has never really worked. It’s supposedly powerful features and insights are just too hard, or too expensive. It’s also the ultimate piece of low-hanging fruit for a business looking to pump up their marketing performance. Technology (n) - the application of scientific knowledge for practical purposes, especially in industry. Stack (n) - a pile of objects, typically one that is neatly arranged. Given these two definitions, what the hell is a technology stack? A Technology Stack (or Tech Stack, for all the cool kids out there) is a set of software components that together form a complete platform for supporting an application or business function. From a Marketing and Sales perspective, the Marketing and Sales Technology stack is comprised of the software that you select to support delivery of your offering to customers - from the moment they first become aware of your business to the moment they become a customer (and sometimes beyond). Now you know what a tech stack is, let’s look at why it’s something you need to think about. Results - a word digital marketers have been afraid of for too long. It’s easy to measure vanity metrics like reach and impressions and likes, but what really pays the bills is understanding your marketing work’s contribution to the bottom line. With a properly configured tech stack, you’ll be able to see what happens to customers all the way from the moment they first touch your business to the moment they pay their first bill. The old marketing funnel - Awareness, Interest, Decision, Action. AIDA. Alec Baldwin’s famous lines. The advent of digital marketing has changed the way we market, for the better. The tools available to us mean that we can manage each stage of our funnels tightly, rather than relying on a series of “pay and spray” disparate actions to get the job done for us. Ogilvy said “I know half my marketing budget is wasted - I just don’t know which half”. We’re closer than ever to knowing. Not only do we get total visibility over the interactions within a funnel, but we can start to build multiple, connected funnels to start to add even more value to prospects where appropriate. None of this is possible without an appropriately configured marketing tech stack. Many people spend so much time trying to get their marketing systems set up and working together that they don’t take advantage of all the features that the systems offer. A properly set up tech stack solves this problem. All your data and information flows smoothly, so you can spend your time working on improving performance rather than just making the whole thing work. Part of improving performance is using features you might never have thought of before - maybe you’ve got a landing page that a lot of prospects revisit, and you want to use the opportunity to collect different information than you did the first time. Hubspot’s dynamic form fields give you this opportunity - but you’ve got to have the headspace to set it up. Have you ever downloaded a spreadsheet of data from one system, uploaded it to another system, downloaded another CSV file, reorganised it, reuploaded it, sent something, collated the results, downloaded another CSV file, uploaded it, and realised you missed an important part of the process? Too many marketers rely on manual tasks and double handling of data to get where they want to go. It costs a huge amount of money and time, and leads to a high risk of mistakes - not what you want from your brand. A well configured tech stack solves all of these problems. You’ll never have to double handle any marketing data again. Trust me. All of this leads to a pretty logical conclusion - a well configured tech stack is going to help you increase ROI. Whatever it is you do, you’ll find that well organised and optimised tech stack saves you a heap of time, gives you deep insight into what’s going on in your marketing, and enables you to focus on improvement. Analytics + Time + Improvement = Increased ROI. Every time. 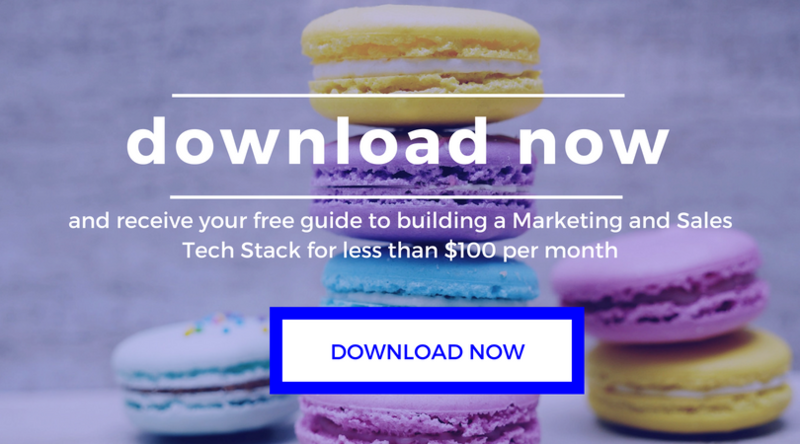 If you want to find out how you can build a Marketing and Sales Tech Stack for under $100 per month (without a developer! ), download our free guide.